14 x Sarojin Suites, 14 x Pool Residences, 28 x Garden Residences. The Sarojin is located in Khao Lak in the Phang Nga province of Thailand. 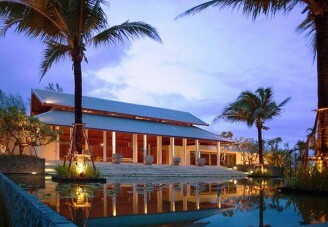 The resort is situated one hour north of Phuket's international airport. The Sarojin has a fleet of luxury cars that are available to meet all guests at Phuket airport. The Sarojin is a unique luxury resort located on the Andaman Sea in Thailand. The resort is in Khao Lak in the Phang Nga province of Thailand and is surrounded by crystal blue ocean on one side and spectacular forests on the other side. The Sarojin is nestled in a garden setting with direct private access to a secluded 11 kilometre white beach. There are 56 guest residences on the property within the 10 acre grounds. The resort is designed in a contemporary Asian style and it merges with its natural local environment and elements effortlessly. There is an age old giant Ficus tree at The Sarojin that is viewed as the spiritual heart of the resort. There is also a peaceful lotus pond to add to the relaxed environs. The Sarojin beach is sheltered by Pakarang Cape, a coral cape headland, so it provides year-round swimming and water sports such as swimming, wind surfing and kayaking. Khao Lak is an area of amazing beauty boasting pure white beaches, gushing waterfalls, green forest, idyllic lagoons and abundant wild life. Khao Lak National Park is home to some of the oldest primary forest in the world and it is easily accessible. The Similan Islands, one of the top ten world dive sites, is also less than an hour away by boat. The Sarojin also boasts a magnificent spa called Pathways. Pathways is a peaceful haven which floats over the main estuary and central energy lay line of The Sarojin and is hidden from view by mangroves. Ancient therapies and massage techniques are combined with modern comforts to help relax and awaken the body and soul. Pathways features two double and two single treatment pavilions with outdoor tree showers and secluded couples baths set amongst natural surroundings. The resort is located one hour north of Phuket’s international airport. The Sarojin has a fleet of luxurious private cars that are able to meet all guests on arrival for the onward transfer to The Sarojin. Refreshments and cold towels will be served. Please contact us for more information on available packages for your stay at The Sarojin. At The Sarojin there are many amenities available for the guests to use. These include a swimming pool, square 25m pool with infinity edge, spa pool lounge area and three drape shaded pool island pavilions, fitness centre with treadmill, lifecycles, multi-gym and free weights, croquet lawn, petanque, water sports including catamarans, sea kayaks, and windsurfers, mountain bikes, library and boutique shop, Thai cooking classes and market visits. Other activities may include scuba diving, golf or tennis!